What timezone is used at Windy? Timeline bar at the bottom of screen Windy uses local time of your computer. 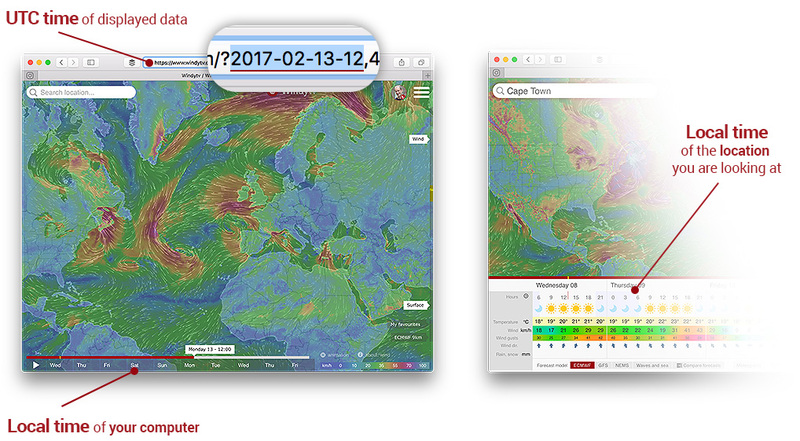 In the detail of any location (when you open detailded forecast) the local time of that particular location is used. Of course, if you open detail in the middle of the ocean, we use UTC, since there is no timezone. How does it handle Daylight Savings Time? I think this matter could be clearer. 1. For example, when I see the forecast for a given location, instead oh "hours" you could put "local time (UTC+x)". Just ideas. Just arrived to your site, Great jobs guys. Can you at least label the timezone unit for every time stamp on the map? Please dont do that. local time is best for the majority of users. There could be a setting to only use UTC time.